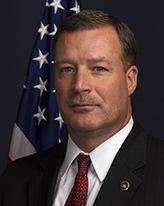 In October 2016, the Bureau of Alcohol, Tobacco, Firearms and Explosives (ATF) selected Stuart L. Lowrey as the Special Agent in Charge (SAC) of the Louisville, KY Field Division. SAC Lowrey is responsible for operations throughout Kentucky, West Virginia, and Southern Indiana. He previously held this position from 2012 to 2015. While leading more than 130 special agents, industry operations investigators, intelligence research specialists, task force officers and support staff under his administration, the Louisville Field Division will continue to successfully disrupt and dismantle some of the most violent criminal groups and gangs, illicit firearms trafficking networks, and expand partnerships with other federal, state and local law enforcement agencies. SAC Lowrey began his career in law enforcement in 1985 working as an undercover narcotics officer in a multi-agency drug task force in Illinois. He joined ATF in 1987 and served seven years as a field agent in Chicago. From 1995 through 1999, Lowrey worked as a supervisory special agent in the Baltimore Field Division, and then moved to ATF Headquarters in Washington, D.C., to lead the Bureau’s Inspection Division, Office of Professional Responsibility and Security Operations. In 2002, Lowrey became the Assistant Special Agent in Charge (ASAC) for the New Orleans Division where he led criminal enforcement operations in Louisiana, Mississippi, and Arkansas for the next seven years, to include regional efforts in response to Hurricane Katrina. In 2009, Lowrey returned to Washington, D.C. and served as the deputy chief in Strategic Management; and Chief of Field Management Staff; and later, Firearms Operations Division. After serving as the Louisville SAC from 2012 until 2015, he returned to ATF Headquarters to serve for one year as Deputy Assistant Director for Human Resources and Professional Development. Lowrey earned his Bachelor of Science degree in Accounting from Southern Illinois University. He graduated from accredited law enforcement programs at the Illinois State Police Academy and the Federal Law Enforcement Training Center in Georgia. In 2008, Lowrey attended the FBI National Academy, a curriculum for law enforcement leaders and executives, and earned a Graduate Certificate in Criminal Justice from the University of Virginia. In 2006, ATF recognized Lowrey as ATF’s Supervisor of the Year. He is a member of the U.S. Senior Executive Service, the International Association of Chiefs of Police, the Police Executive Research Forum, and the Kentucky Association of Chiefs of Police.